Once again I found myself reaching for these Garden Party papers by Pebbles. They've been quite the favorite of mine this spring. I'm pretty sure this is the first time I've used the bee paper at least. 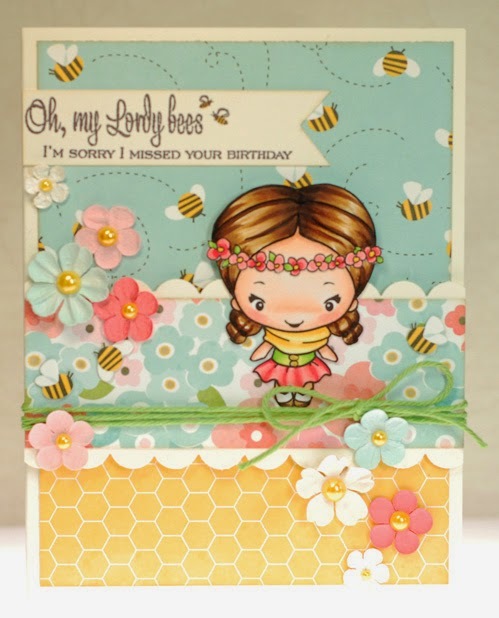 And how could I not use that sentiment stamp with all those bees buzzing in the background... it was too perfect of a pairing, LOL! Anywho, I hope you are enjoying a lovely week so far. 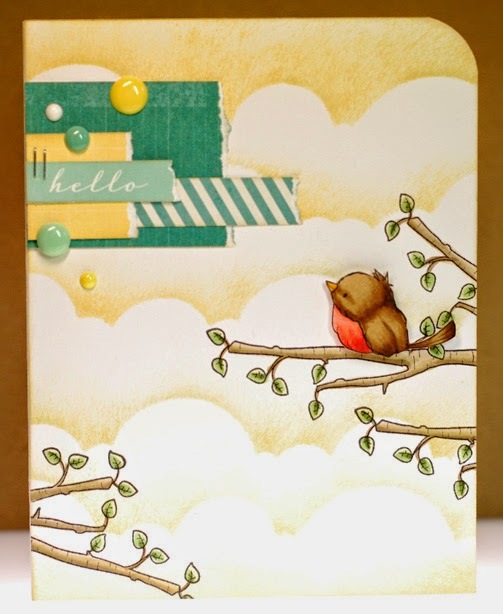 It's been a while since I've played along in the Farm Fresh challenge over at The Greeting Farm and since I recently got my hands on Frappi Anya it was the perfect time to join the fun. This week's challenge is to use pastel colors so I flipped through my paper scraps until this pretty stripe caught my eye... talk about pastel perfection, LOL! Well, I should get a move on. Have a good one everybody! 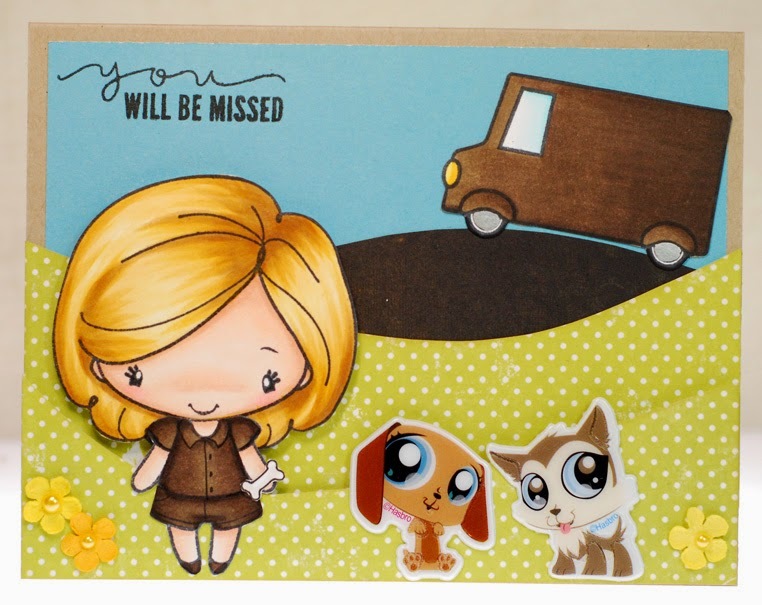 We've had a totally fabulous UPS delivery lady for years and she is retiring this week so I thought it would be nice to make her a personalized card. While many will miss her smiling face as she dropped off our packages, I think the neighborhood pups may miss her most of all. She was always ready with a treat and not a single wagging tail was ever left out. Heck, I'm pretty sure she even new most of their names as well, LOL! It also gave me a great excuse to ink up this little truck stamp set that I got recently. All I needed to go along with it was a "Delivery Anya". So I grabbed Picture Perfect Anya for her head and altered Twirl Anya's shirt just a bit until I had the perfect Anya for my card. Alrighty, time for me to tackle another busy day. 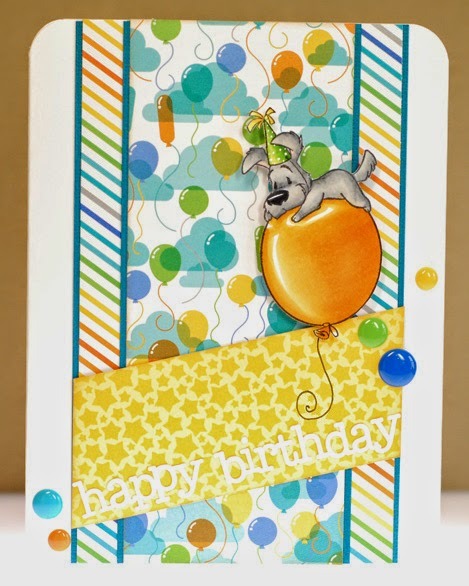 I also got my hands on this great Doodlebug birthday paper pad in the same order and that balloon print was a natural choice to help showcase this party pup. Doesn't Pepper look like he's getting a bit carried away with the festivities? LOL! Ok then, sorry to have to keep this one short and sweet but I'm on the run this morning. 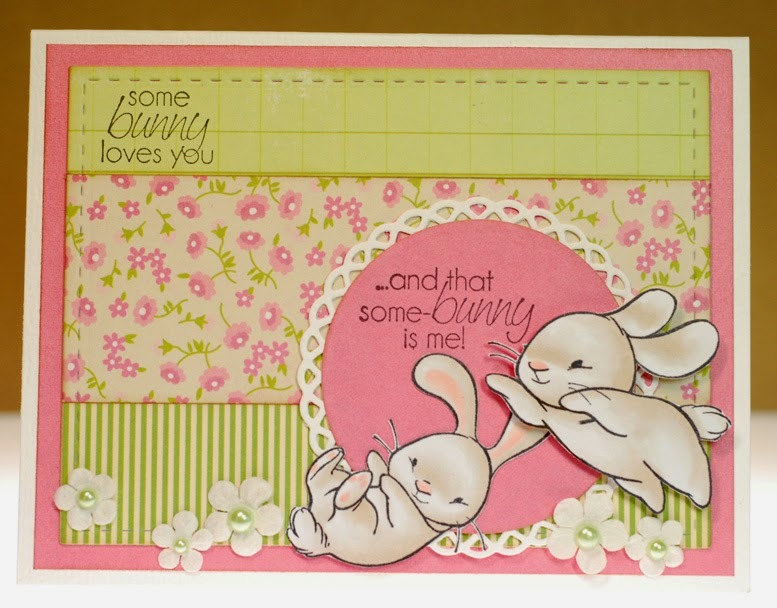 Anywho... as for my card, more new stamps arrived in the mail Thursday so I was able to play with these two bunnies from Sister Stamps. One is called Jade and the other is Moon and they are both completely adorable. There is a slight alteration to Moon, I wiped away his bell collar so that they would both look like a couple of wild Easter bunnies. 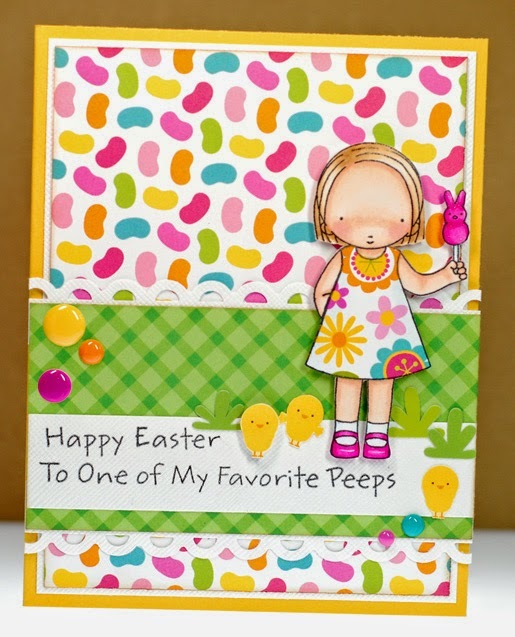 I then paired them up with an Amy R sentiment that I've been waiting to use on just the right card and this one was it. Alrighty then, off to work I go. All in all, a simple Easter card but hopefully it keeps my creativity flowing so I have more to share here. Ok, time to get myself ready for another day of work. Ok, time for me to run. 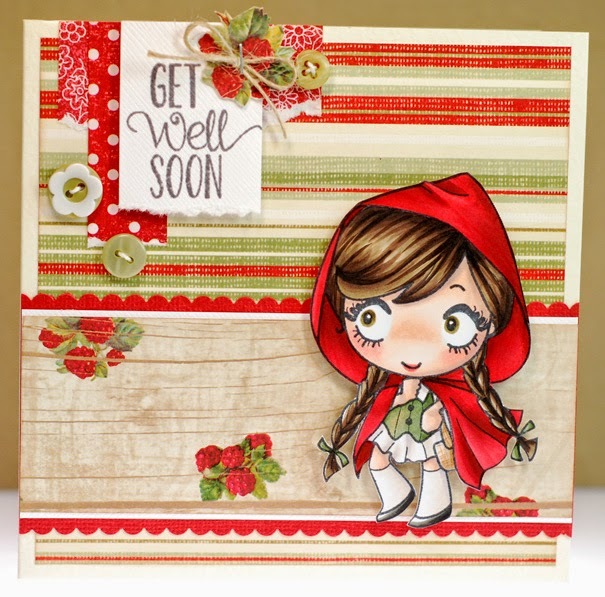 I've been pretty swamped lately so not a lot of card making going on. Still, I hate seeing the blog empty day after day so I thought I would throw up a non-coloring card that I made last month. It's all just a bunch of Pebbles Garden Party papers that I fussy cut into accents and what not. Pretty simple but still bright and fun. Ok, gotta run again... laters! I paired Kaylee up with some Happy Go Lucky scraps that were hanging around and as always, colored her up to match. I think this color combo is so pretty, especially with that orangey yellow... love it! Some bling and a few little flowers and this card was done. I cut into the fourth new My Mind's Eye paper pad that was on my desk, which also ended up inspiring me to use a yellow ink for the sky background rather than the traditional blue. Sure, I didn't use a whole lot of paper on this card but it always feels good to cut into a new paper pad sooner rather than later. A sprinkle of enamel dots and this one was done and ready to go into the pile of animal cards I've been collecting for my sister. Alrighty, before I sign off for the day... any other Walking Dead fans out there? What did you think about the finale on Sunday? I've been reading the comics as well so as soon as Terminus was introduced this season I had a sneaking suspicion that they would be the show version of the cannibal group and it doesn't look like I was wrong. I really can't wait to see what happens next and find out what has happened to Beth because I don't think it is the Terminus group that snatched her... too bad October seems like such a long time!